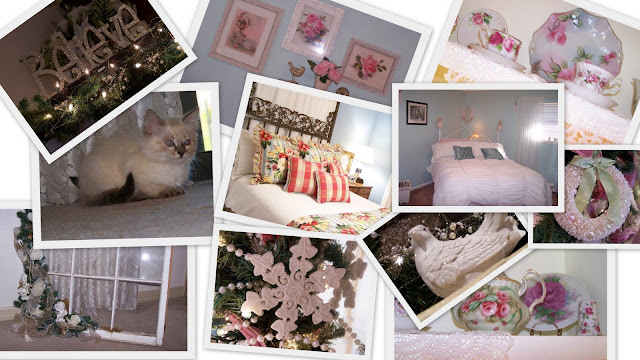 Although I have only been blogging for 3 months, I picked some of my favorite pictures for a collage of the year. I am excited about the upcoming year & hope you will check back with me often. Have a very happy & blessed New Year. What a stunning and beautiful collage photo. What a sweet little doll. What a beautiful collage, the photos are eye candies. Thanks for your lovely comment on my blog, to answer your questions: I use a Pentax Optio S10 little digital camera, nothing fancy, I don't really know how to use special lenses and all that. But it seems to take alright photos. As for software, I sometimes use Photoshop to add texts and do things to photos like blurring the edges etc, but most of the time, they are just straight out of the camera. What a beautiful mosaic you have!! I adore that bed too, so pretty!! Wishing you a fabulous 2009, Happy New Year! Your collage is lovely! You have beautiful things and it is a treat to look at them. Hope your New Year came in wonderfully well and the coming year will be overflowing with blessings from the Master's hand. I have an award for you if you would like to stop by and pick it up. Have a beautiful day. Gorgeous photos! I love your rose prints! And of course, that sweet little kitty cat! Thank you so much for the Award!! How sweet! I love your blog too! !